Apple's financials for the holiday quarter were lower than the company intended going into fiscal year 2019, but while issues in China caused revenue to dip, the rest of the figures suggest there is far less to worry about, and in the case of Services and other elements, areas to be happy about. 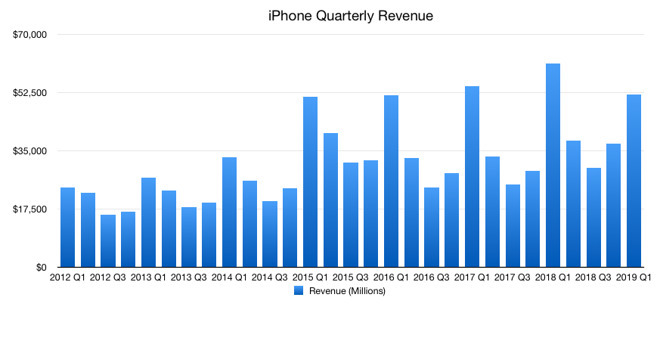 For the first quarter, Apple reported $84.3 billion in revenue, which is a 4.5-percent decline in revenue compared to the same quarter last year. This isn't a surprise, as Apple itself warned the market in early January that it would miss its forecasted range by between $5 billion and $9 billion. While this did hit the share price in the weeks that followed the announcement, it is more about how Apple bounces back. Its current forecast for the second quarter has revenue between $55 billion and $59 billion, undercutting the $61.1 billion it earned in the period last year. It is worth noting that, though revenue is down 4.5 percent from last year, net profit has managed to stay relatively static, losing just 0.5 percent of its value. 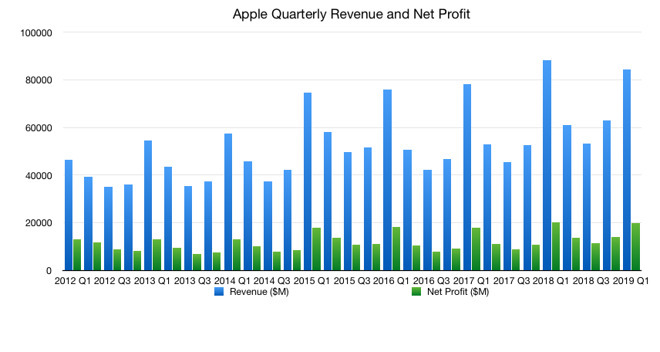 In effect, Apple is reporting that it has earned proportionately more net profit in the quarter compared to revenue than in Q1 2018. The overall gross margin is down 3.5 percent year-on-year, but a poor result isn't entirely unusual for the first quarter. 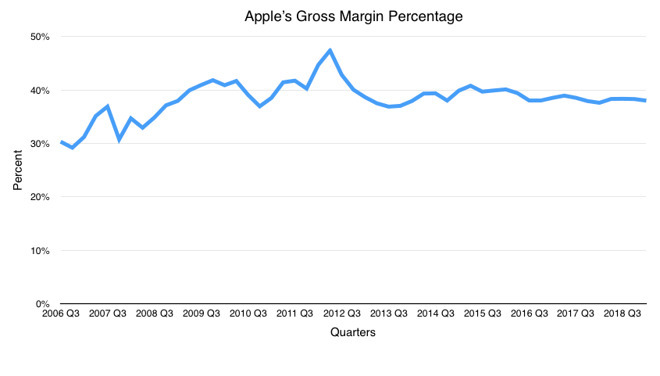 For the 2013, 2014, and 2016 first quarters, Apple achieved single-digit year-on-year gross margin growth, while shrinkage happened for 2017. In 2018, it reached 10 percent, while 2015 saw a massive 36.1 percent gross margin. With the exception of 2018 and the entirety of 2016, which saw a contraction throughout the year, the gross margin in the first quarter is typically dismal in comparison to subsequent quarters. Generally speaking, the gross margin is roughly where it usually lies, hovering a few percentage points below 40 percent of the value of revenue. During the conference call, Apple CFO Luca Maestri advised its products gross margin was 33.4 percent, while the Services arm saw a margin of 62.8 percent. The big story from Apple's regional figures is the decline in Greater China. The region saw a 26.7-percent year-on-year drop in revenue, in part due to fewer iPhone upgrades than anticipated by the company. 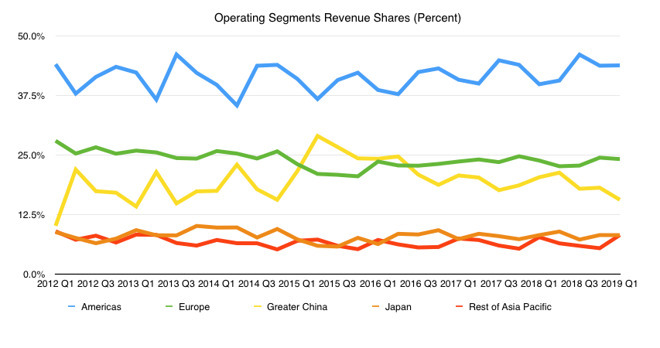 Greater China isn't the only region to see a revenue decline, albeit not at the same level, with Japan down 4.5 percent and Europe down 3.3 percent from last year's figures. The Americas are up 5 percent overall, meanwhile the Rest of Asia Pacific is up 1.1 percent. 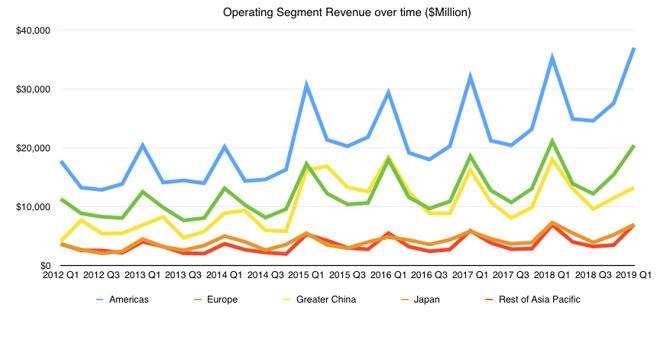 In terms of market importance based on revenue, the Americas are still the biggest for Apple, followed by Europe, then Greater China. Japan and the Rest of Asia Pacific region are effectively tied with an 8.2 percent revenue share each. The iPhone is the biggest influence of Apple's revenue, and given overall revenue is down, it is easy to see where the shortfall stems from. Apple earned $51 billion from iPhone sales in the quarter, with the shortfall of $9.1 billion representing a drop of 14.9 percent from last year's level of sales. This is also the first quarter under a new accounting policy where Apple only reports revenue for its products, and not units. This also means calculations for the average selling price (ASP) of devices is also not possible to perform. Revenue from the iPad is up year-on-year by 16.9 percent, though compared to the iPhone, its $6.7 billion in revenue is less significant to the bottom line. 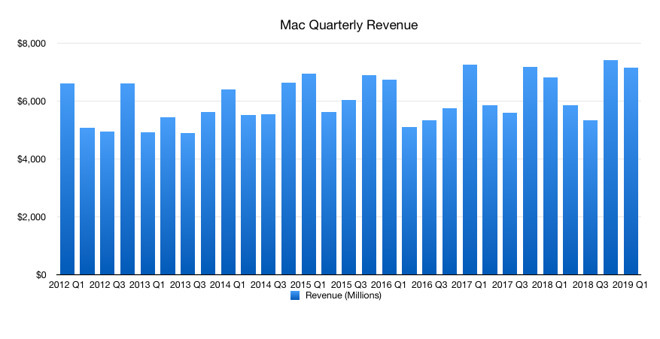 A similar story could be said about Mac, which generated revenue of $7.1 billion in the quarter, up from the $6.8 billion last year by 4.7 percent. It is also worth noting that Apple made another major change to its reporting of products. A category identified as "Other" has been replaced by one titled "Wearables, Home, and Accessories." While it is likely to be covering much of the same ground as Other, it cannot directly take over from the older category as there may be other unidentified differences. For reference, the new category earned $7.3 billion, which Apple claims is up from the $5.5 billion it would've earned if it were reported in Q1 2018. For that quarter, the Other category reported revenue of $5.5 billion. Possibly the high-point of the quarterly results, the Services arm has broken the $10 billion milestone, achieving $10.9 billion for the period. This is the first time the Services arm has reached double-digit billions, but it remains to be seen if it will stay there, as the value does drop slightly for second-quarter results. Services has been quite consistent with its growth, pulling in double-digit year-on-year improvements since Q3 2015. This quarter's 19.1 percent may not be as high as the 27.3 percent growth from Q1 2018, but it still demonstrates there is still room for the business to grow further in the coming quarters.